All this week, in honor of the debut of FIRE’s new Student Defenders program, we’ll be profiling students already involved in these initiatives at a handful of colleges and universities across the nation. While these groups are different at every school, student defenders are united by a common mission: helping peers accused of conduct violations navigate their school’s often confusing disciplinary systems. The student defenders we’ll introduce you to this week all told FIRE it’s important work that makes their campuses safer and fairer for everyone. They said practically anyone can get involved, and that more campuses would benefit from having a group like the one they run. FIRE’s Student Defenders program aims to make that a reality by providing undergraduates the resources they need to launch a student-defender initiative on their campus. First up is our recent conversation with The College of William & Mary’s Marvi Ali, who was chair of the school’s Conduct and Honor Advisor Program before graduating this past semester. (She’s off to law school at Wake Forest University in the fall.) Here, Ali tells us why she thinks a student-led approach to conduct and discipline at William & Mary leads to better outcomes for students, and how being a student defender made her more open-minded and empathetic. FIRE: Hi, Marvi. Can you tell us a little about yourself and give us an overview of the program you run? Marvi Ali: My name’s Marvi Ali and I’m a senior at College of William & Mary, I’ve been part of this group, the Conduct and Honor Advisor Program [CHAP], since my freshman year. Now I’m the chair. At our college we have a student-led honor council and a student-led conduct council. And then we have the dean of students office which oversees and helps the different councils function. My group, CHAP, is a separate group. 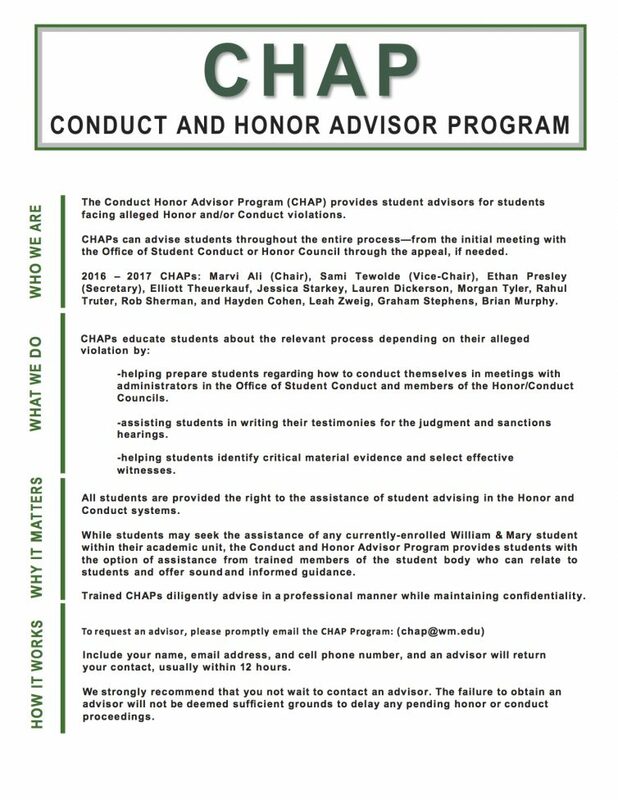 The main thing we do is serve as advisors for students facing alleged honor and conduct violations. We also sit in on the bylaw reviews and go over the school’s honor code and conduct code and discuss ways to make things better. FIRE: What’s the process like for accused students? MA: So, when a student is contacted and accused of violating either the honor or the conduct code, they are also given our contact information. Right away I assign one of our advisors to them and they set up an initial meeting. And then, if the case is required to go to a hearing, we can help them prepare. A big part of what we do is explain what kind of witnesses we’re gonna need, and help them write their testimony. In the hearing itself, we don’t act like lawyers. What we can do is, at the end after all the other questioning, then I can question them, in a non-leading way to bring up any evidence they didn’t discuss yet or point out something about the student the panel didn’t necessarily know. Another thing we started doing this semester because I thought it would be important, is we started helping out with Title IX cases. I started doing a Title IX training for our advisors so we can help translate all of the administrative jargon for the students and help students know how to proceed so they don’t feel lost or alone. At times, we’re a little bit therapist, a little bit advisor, a little bit stern. FIRE: How many conduct advisors do you have right now? FIRE: What is your relationship with the university like? Do you encounter any pushback? Other students we’ve talked to have reported pretty good relationships with their administrations, but it seems like there’s a spectrum, from symbiotic relationships to adversarial ones and everything in between. MA: We’re definitely on the symbiotic relationship side of the spectrum. One challenge we do have is if we want to make a change or have an idea, getting that implemented can be a little bit slow, but I feel like that’s a universal problem. I have weekly or bi-monthly meetings with the dean of students and we’re on a first-name basis. I’ve known him for many years and he’s extremely responsive. That being said, he’s also extremely busy, so some things that are a priority for our group aren’t necessarily on the top of his list. But we also have an Honor System Advisory Committee and we have four or five of those meetings a semester with students and the Dean of Students and one professor and we come up with handbook proposals. For example, we just got one passed last week about confusing wording in the student handbook. So we got that changed. Occasionally we do have cases where either we or the student doesn’t think that the process was carried out fairly or that the sanction was excessive, and we have an appeals process for that. Also, it depends on who the sitting panel members are. We’ve had council members in the past who are more strict. At our most recent advisory committee meeting we also talked about reforming some of our sanctions, like having different kinds of probation before jumping to suspension, or whether there’s a way to make probation more productive than just giving students a warning. So we have conversations about this all the time which makes me grateful for having such a cooperative administration. It makes me feel like everyone has both the students’ and the community’s interest at heart. FIRE: What are students like when they come to you? From talking with directors of other student-defender programs, it sounds like students are typically pretty scared and don’t know a lot about their rights. Is that your experience, too? MA: There’s definitely a diversity of reactions we get at that initial meeting with the student. It’s especially important to point them in the direction of different campus resources: academic, counseling, health, and extracurricular. So we can recommend different avenues for them to better their situation. And the way I’ve been training our new members is to always leave the student with full information of the process so they don’t feel lost or confused and give them a checklist of things to do. I think that’s just a comforting, more goal-oriented approach. We’re being a comforting presence by helping them be productive. FIRE: What would you say to someone who might be weighing the pros and cons of using your group’s resources, versus heading into one of these proceedings alone? MA: That definitely happens. Occasionally we have students who are not responsive to our advice and choose to wing it. I think it’s easier for the whole process if the student is prepared. It’s better for their mental health for sure. Also, having a prepared testimony is very helpful. When a student is writing their testimony, I tell them to go into detail and try to think about what kinds of questions the council is going to ask so the student isn’t blindsided. FIRE: What’s the workload like? MA: People always ask me this question and I never have a short answer to it. It depends if you’re on a case. When you are on a case and the hearing is upcoming, an initial meeting can take anywhere from 30 minutes to 2 hours. Then there’s follow-up meetings, usually 30 minutes to an hour, a lot of correspondence is over email, and the timing of the hearings also varies dramatically. Some hearings are maybe three to four hours long. Others start at 5 pm and go until 2 in the morning. When you are on a case you need to be present and you need to be checking your email and you need to be doing your homework in advance so you can meet when the student needs you. But when you’re not on a case, it’s a lot less of a workload. FIRE: What are the pros and cons involved in being in a group like this? MA: There are definitely a lot of pros. It’s very rewarding to really form relationships with the students. And learning that there’s always more sides to a story than you might think. It’s also very important, in the name of due process and justice, to go out and make those known for the best possible outcome. It’s helped me grow and be more open-minded and empathetic. And that’s definitely what we look for when we’re finding new members. FIRE: What would be your advice to a student who wants to create a group like this? MA: I think it depends on how their college’s conduct processes work, but I think they should reach out to the administration and have a friendly relationship right off the bat. I would tell the administration that you think it’s a presence that’s lacking on your campus, and that it will make the administration’s job easier because you’ll have students coming into these hearings with the right information. They’re not misinformed, and they’re properly prepared. It’s not just better for mental health, which is a huge thing on my campus because college can be beyond stressful, but it’s also a really self-sustaining group and, honestly, doesn’t require much funding. Also, I’d really recommend an advisory committee like the one I mentioned. We got a lot done in a short amount of time because we had all the people in the same room who could discuss things and make changes. We can fix the problems if we can get everyone together with that productive mindset in the same room, looking at the student handbook and looking at how to make things better. To learn more about how you can get involved with a student defender program, or create one of your own, visit FIRE’s new Student Defenders page. And check back here all week for more Student Defender profiles.